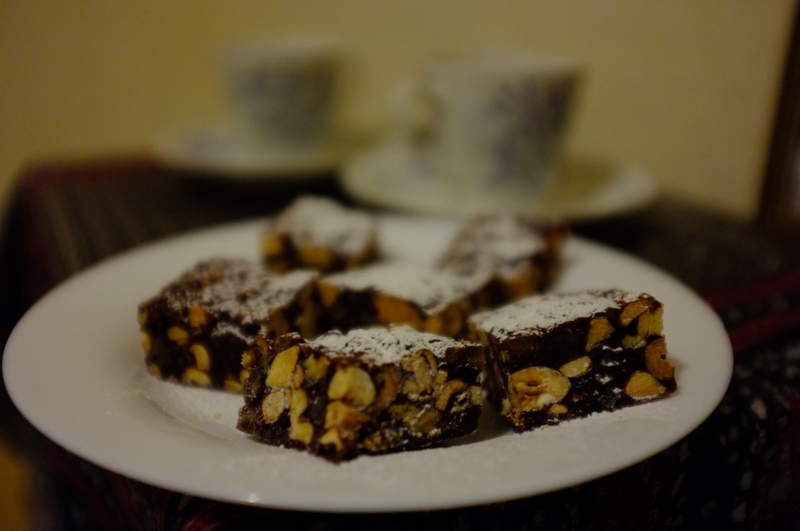 As promised here are the photos from the Valentine’s day menu I posted last week. I ended up omitting the prosciutto from the starter; my Italian employer told me that meat doesn’t go on bruschetta, and it did seem like overkill. 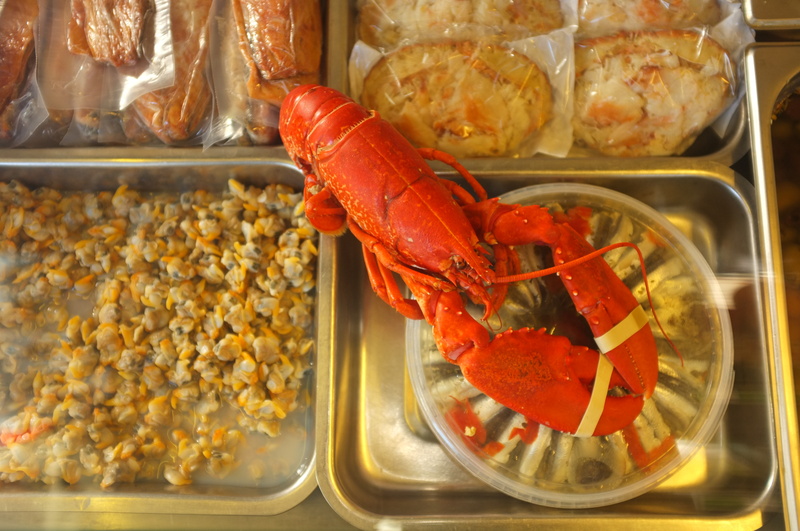 I got to the fishmonger on Magdalen Street just in time after work and I bought mussels, prawns and a big piece of coley; a white fish which is similar to cod. Having chopped the veg, scraped the mussel shells and blitzed the rouille beforehand, the meal was a simple assembly job when Annabel arrived. 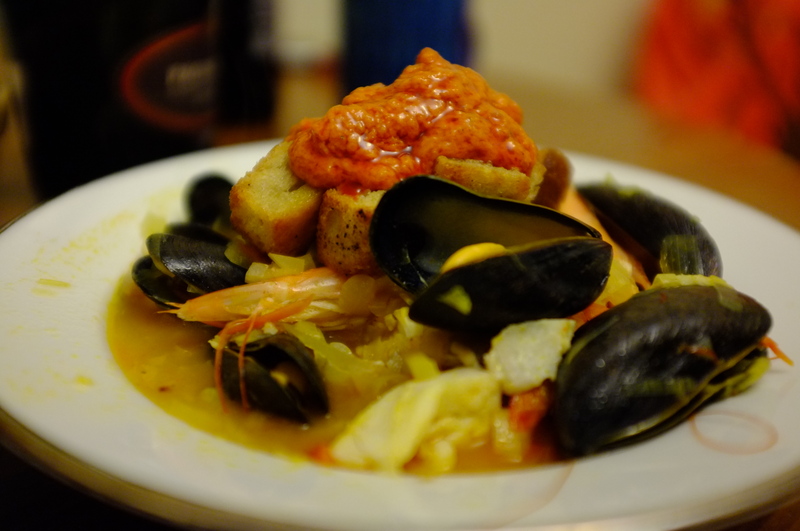 After seasoning the soup, in went the seafood for no more than three minutes; just enough time for the prawns to turn bright pink, the fish to become flaky and tender and the mussels to hinge open revealing their hidden orange treasures. This green and purple thistle is one of Annabel’s favourite things. 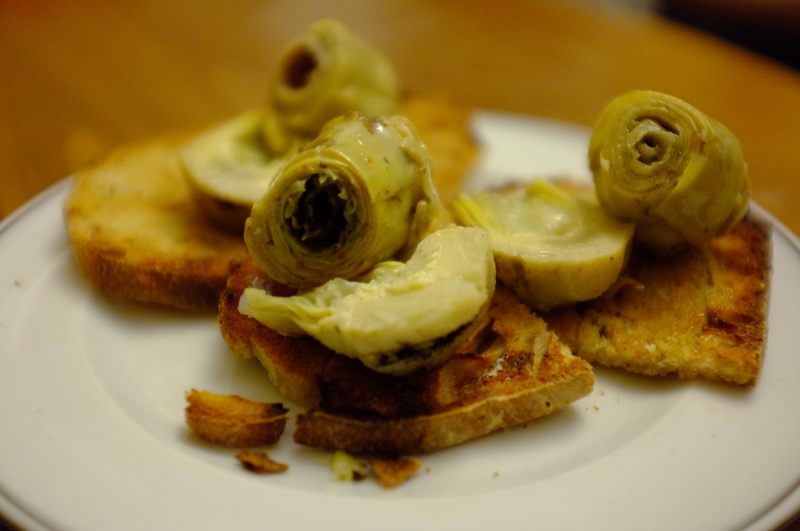 In Rome they eat them cooked in butter, garlic and wild mint, but seeing as they are not in season I’ll pick up some preserved artichoke hearts from Amaretto, Norwich’s best delicatessen. 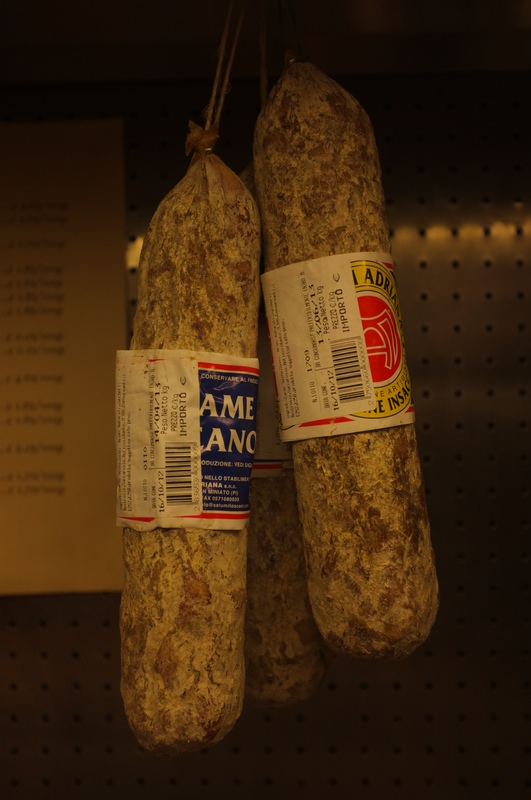 We are going to combine them with prosciutto and griddled sourdough bread to make a simple bruschetta starter. This will go well with a glass of cold bubbly! 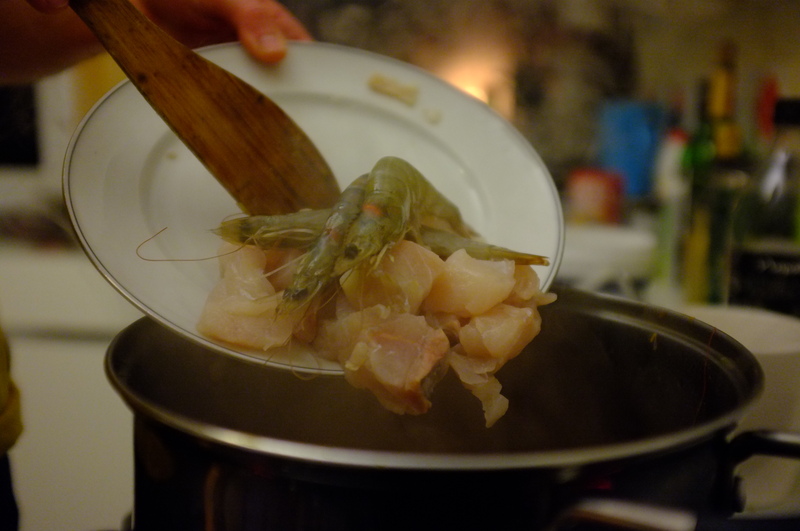 I promised Annabel no fish heads this time, so we are compromising with a few shell-on prawns. 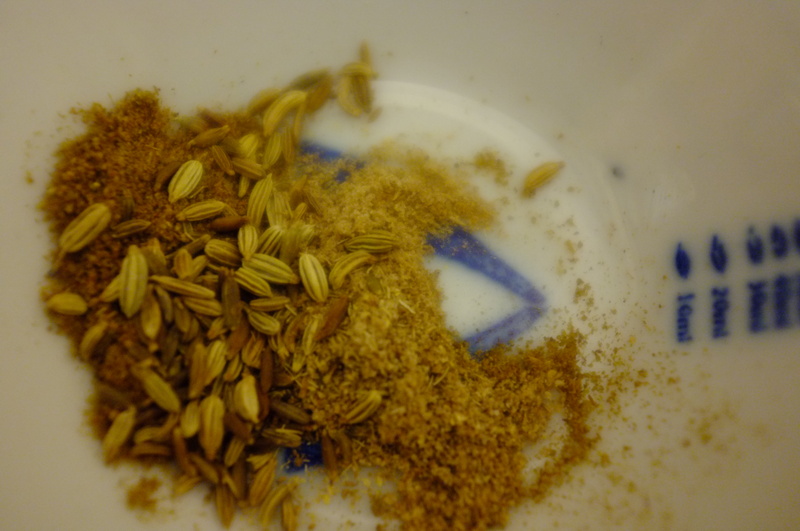 I’m basically going to use a Boulliabase recipe that I’ve made before and integrate Tunisian spices; coriander, cumin and saffron. I’ll fry coriander, cumin and fennel seeds in hot oil, then add an onion, a finely chopped bulb of fennel, garlic, and fresh tomatoes; added just in time for their juice to prevent the spices from burning on the bottom of the pan. 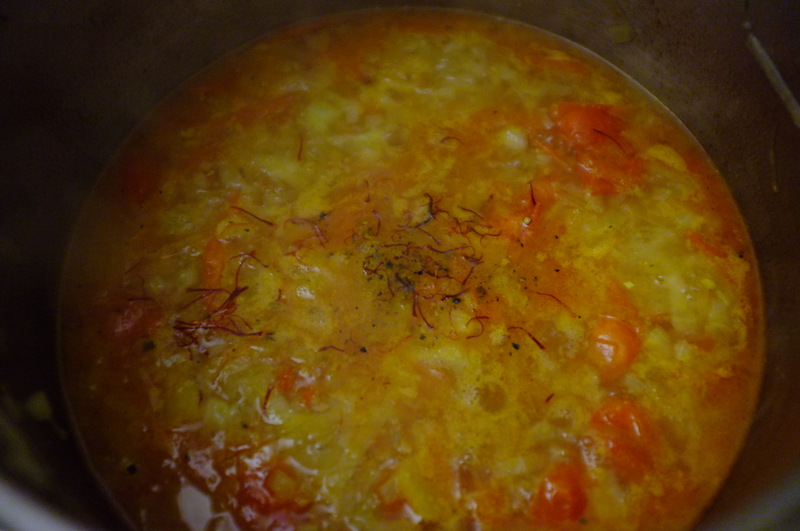 Into this fragrant bubbling concoction I’ll add fish stock and a good pinch of saffron – making sure the soup doesn’t heat beyond a simmer. 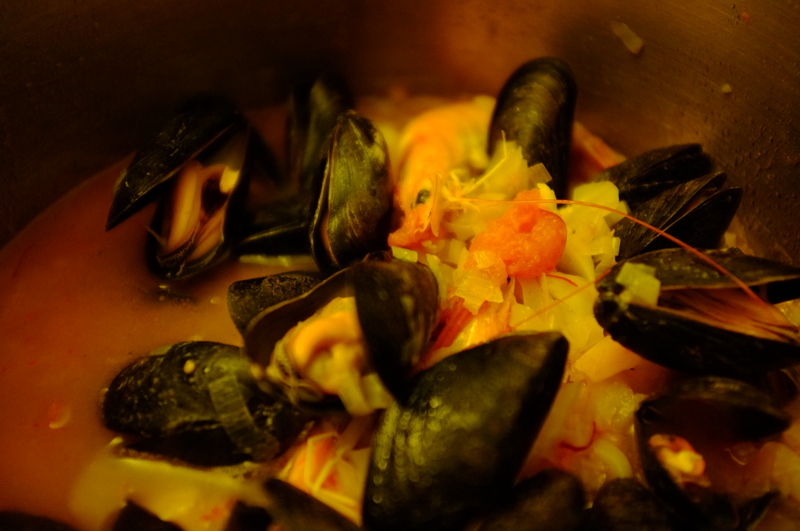 As soon as the fennel starts to become tender I’ll add a tot of Pernod, then in go the mussels, shell-on prawns, a big handful of white fish chunks and salt and pepper to season. Each bowl of soup will get a handful of crunchy sourdough croutons, some fresh parsley and a dollop of char-grilled red pepper and chilli rouille made with plenty of garlic and extra virgin olive oil. Preheat the oven to 180°C, gas mark 4. Lightly butter an 18cm-square loose-bottomed tin and line the base and sides with rice paper. Bake the nuts on a tray for 12-15 minutes till golden brown. Cool, then roughly chop and transfer into a bowl with the peel and sift in the flour, cocoa and spices. Turn the oven down to 150°C, gas mark 2. Put the sugar, honey, and butter in a saucepan and gently heat, stirring till dissolved. Bring to the boil and boil until it reaches the ‘soft ball’ stage (113°C-118°C on a sugar thermometer). To test this, you can also scoop some out on a spoon and drop into a jug of water: it should go into a soft ball. Stir in the nut mixture, pour into the tin and smooth the surface with an oiled potato masher. Bake for 35-40 minutes. 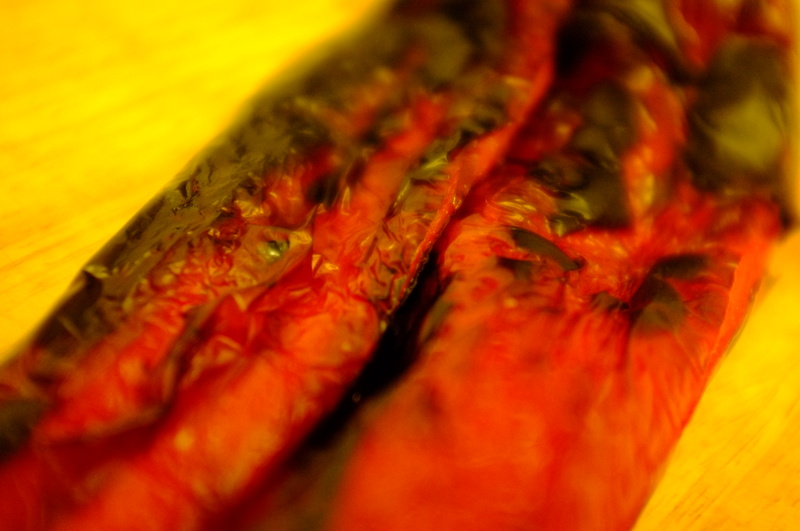 Remove from the oven and leave to firm up in the tin on a cooling rack. Remove the tin, trim the paper, sieve over some icing sugar and cut into slices or cubes. Annabel has promised to combine the roles of Sous-chef and photographer on thursday, so expect some cracking photos this time next week! What’s the fuss about posh dried pasta? Mike Sissons, author of Global Science Books explains the science behind the firm texture of good pasta; ‘The key features of durum wheat include its hardness, intense yellow colour and nutty taste.’ High protein semolina* from good durum wheat is made up of uniform protein particles and minimal starchy particles which makes the dough strong and elastic during manufacture and firm to the bite when cooked. If the correct balance between protein and starch is achieved the pasta shouldn’t shed too much starch into the cooking water. In her book, Italian Food, Elizabeth David concurs that the dried pasta with the best flavour and texture is made using very hard water and the highest quality durum wheat. Naples is the home of such favourable conditions which is perhaps why Napolina spaghetti, at £1.55 per 500g, is more than twice the price of its Tesco ‘Authentic Italian’ counterpart. The latter comes in at 65p per 500g despite the nutritional information on the two packets being very similar. But does sauce adhere to Napolina spaghetti more than cheaper brands? Azélias Kitchen has a highly educational post on bronze die pasta. 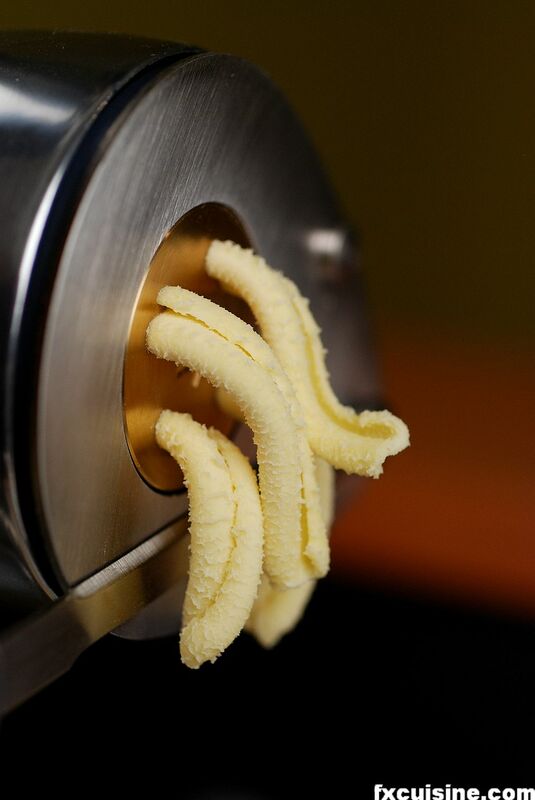 When making pasta, dough is extruded through a stamp mechanism called a die. 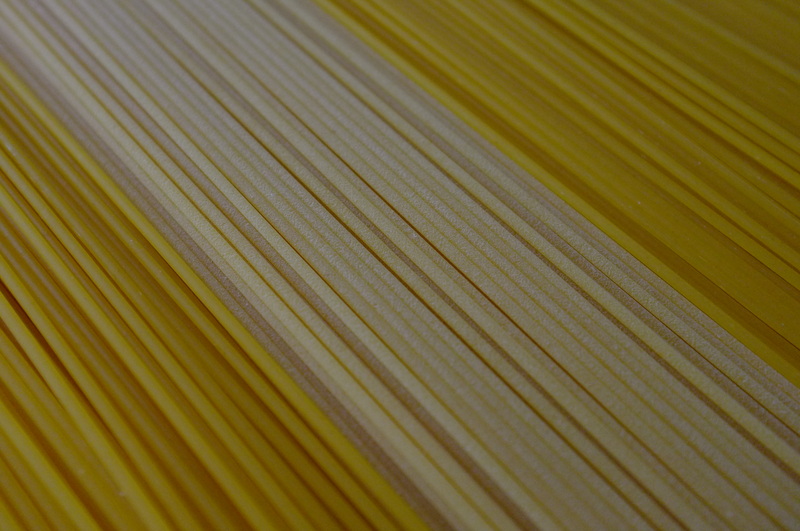 The shape of the die determines the shape of the pasta and the material the die is made of determines the texture of the finished product. Though Napolina spaghetti costs £1.55, it is extruded through the same synthetic die as the cheaper brands which gives the pasta a shiny sauce-repelling texture. The best dried pasta is made using a traditional bronze die, which makes the pasta rough and absorbant, the perfect surface for soaking up sauce. The spaghetti in Napolina’s Bronze Die range costs £1.99 for 500g. So there you have it, the very best dried pasta on offer is made in Naples out of the finest quality high protein semolina from durum wheat. The dough is mixed using the local hard water, before being extruded through a traditional bronze die and slowly dried. That is a lot of things to remember if you do decide to splash out on a pack of dried pasta. The main buzzwords to look out for are ‘bronze died’; Generally if the manufacturer has gone to the trouble of using a bronze die, then their ingredients will also be of good quality and their method sound. Having conducted this research I cooked a spaghetti bolognese with Napolina Bronze Died spaghetti last night. With all my newfound knowledge I thought the spaghetti would dance a waltz around my mouth and romance my taste buds. However, my initial reaction was sceptical with regards to the value of the product. Luckily the ragù alla bollognese made up for the disappointing spaghetti. I used up the dried porcini left over from the mushroom risotto I made last week and it was fantastic! Despite falling at the first hurdle, my gut feeling is that good ingredients and traditional processes must yield a superior product, so I will continue looking for a pasta whose taste lives up to its credentials. My Introduction to the world of cheese came unexpectedly one summers evening five years ago. I was at the local cricket pitch on a thursday evening when I met Will Atkinson who, with his wife Caroline, had just moved from London to establish a herd of milking goats. At the time I needed money to go travelling and Tom to supplement his student loan. We began working at Hill Farm that summer; mucking out barns, helping to inoculate the herd and trimming hooves among other farm maintenance jobs. After a while I got to know the goats quite well. The herd is made up of British Toggenburgs, British Saanans and Anglo Nubians; the first two for their good milk yield and the latter for the high butterfat and protein levels in their milk. 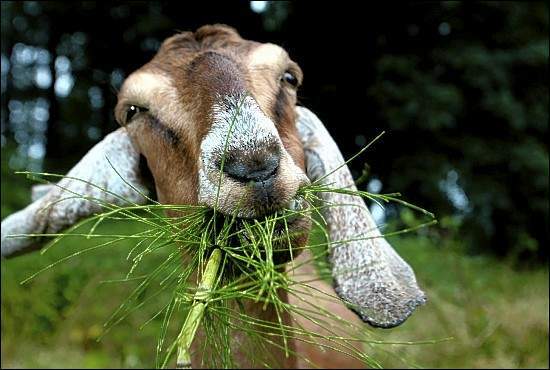 They like eating fresh hay and the bark and leaves of deciduous trees. They will gobble up nettles that have just been cut but they won’t bite into one that is growing. they don’t like drinking out of dirty water troughs, nor do they much enjoy the rain. They enjoy head-butting and climbing on pretty much anything they can get their hooves on; especially if it happens to be a fencing rail you are trying to hammer to a post, or the truck that you are trying to load. 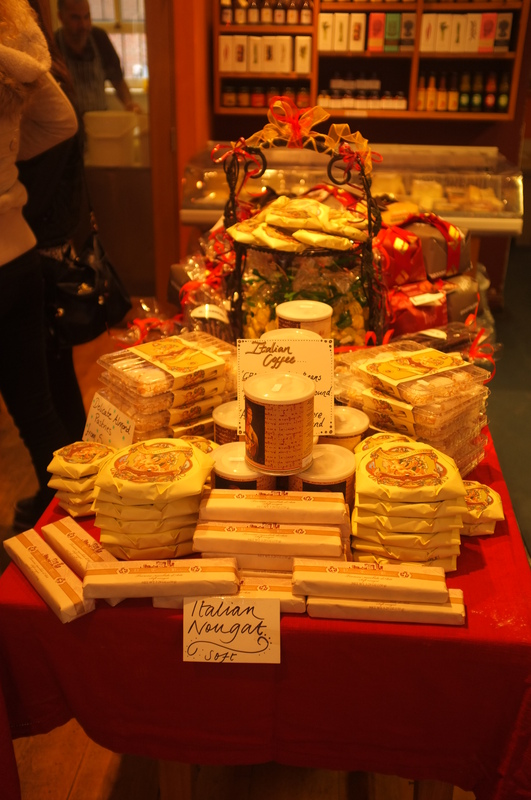 While in London Caroline had worked at Neal’s Yard Dairy, and from the start of their cheese-making careers, she and Will had the support of what is widely known as “London’s foremost cheese Store” (Dana Bowen, The New York Times). 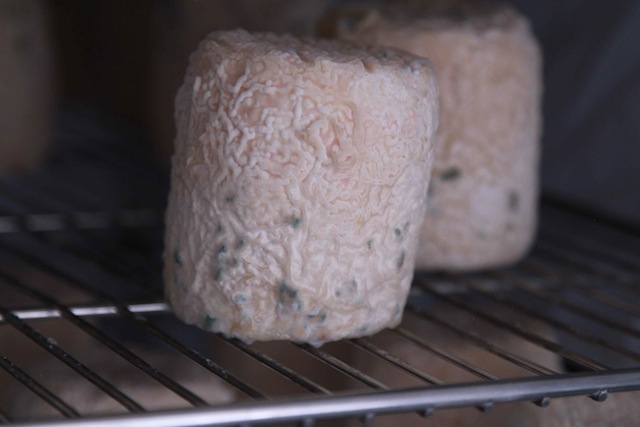 According to Neal’s Yard Dairy’s website their ethos involves keeping ‘in close contact with the cheese-makers’, and in my experience this cooperation is the keystone of the company’s success. It was during one of these visits that Tom and I sat down to lunch with Will, Caroline and David Lockwood, Neal’s Yard’s Managing Director. We shared some excellent Stawley Cheese and a loaf of Dad’s white sourdough. At the end of the meal David offered me and Tom Christmas temp work in Neal’s Yard’s Borough Market shop. 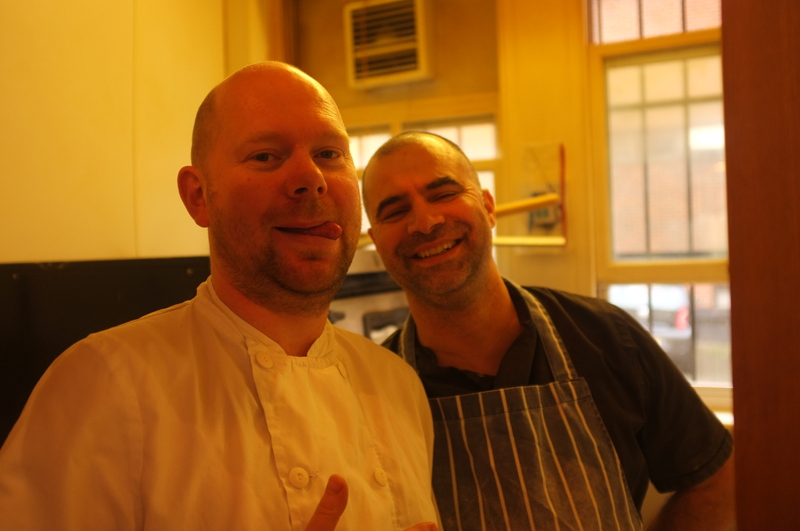 The following three Christmasses I spent the ten days leading up to Christmas Eve plying my trade as a cheesemonger. Following the cheese’s journey from the rich green pasture of Somerset to the cobbled streets of Borough Market, I trod the path that millions have trod before me for over eight hundred years; bringing the abundance of the countryside to feed the people living and working in the metropolis. We have are over 700 varieties of cheese in these isles now (more than the French), and Neal’s Yard Dairy is a showcase for some of the best of them. It is always a pleasure to work alongside like-minded people, and the queue out the door and down the street is a challenge I relished. 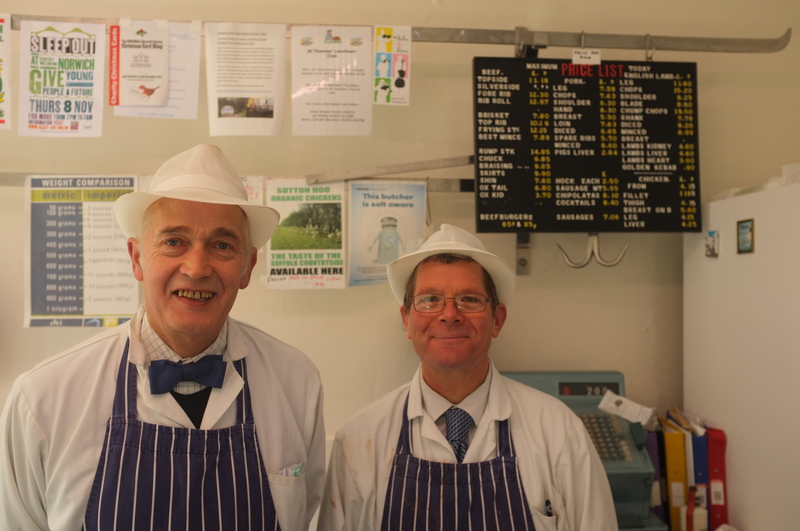 Whether you’re after a whole Colston Bassett Stilton or few 100g pieces, the dairy staff will ensure you taste plenty of different cheeses to find the right one for you. The fact that Hill Farm’s Stawley happened to be the right cheese for many of my customers is purely coincidental! You may as well have the craic with the self-service check out for all the banter you get out of supermarket employees. 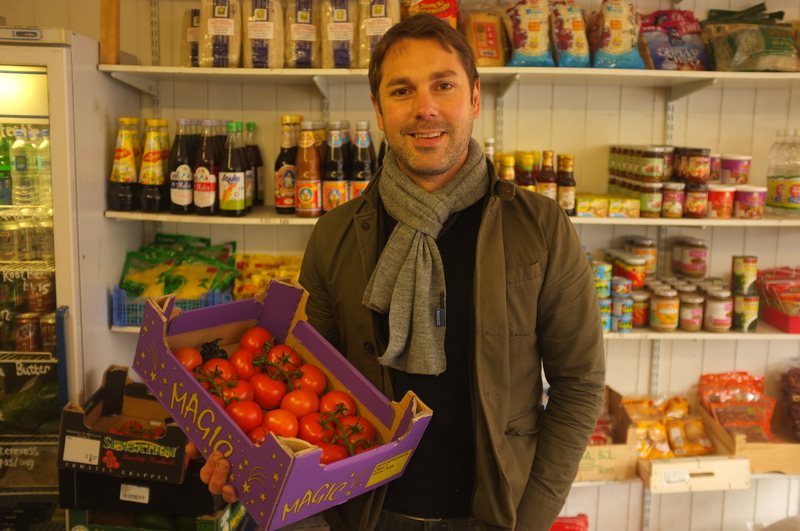 Unlike your Tesco Express worker, who has never met the CEO Philip Clarke and has no relationship with the suppliers, the shop-keepers that I spoke to today have an intimate relationship with where their food comes from. 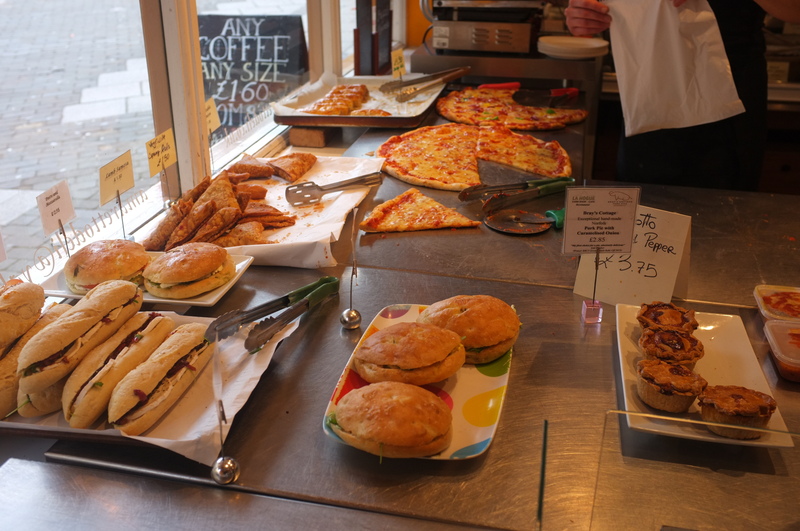 Today I cycled around Norwich and had a poke around in five of the city’s best small food shops. I shop regularly in three of them and two of them I visited for the first time today after many recommendations. 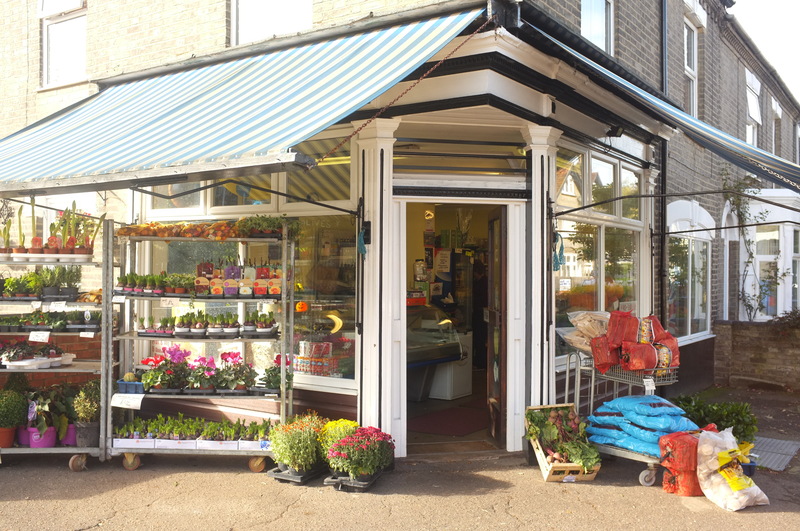 In all five the shop-keepers were happy to chat about their businesses, their customers, their suppliers and their work. Initially I was drawn to this shop for a fortnightly fix of Linghams chili sauce, but I soon realised that the herbs and most of the vegetables are far cheaper than the supermarkets. 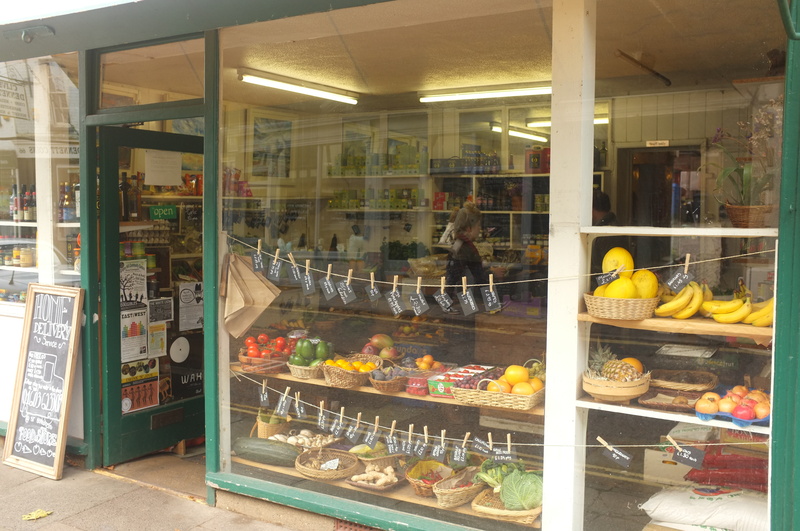 I recently stopped by and picked up a large courgette, an aubergine, a butternut squash, an onion the size of a football and two bunches of fresh herbs all for £3! 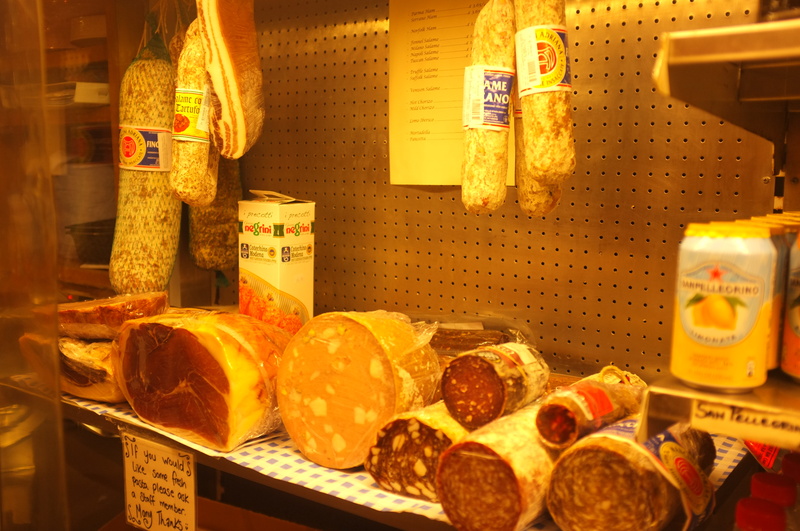 The owner, Tom, runs a wholesale business as well, delivering to many of Norwich’s restaurants. 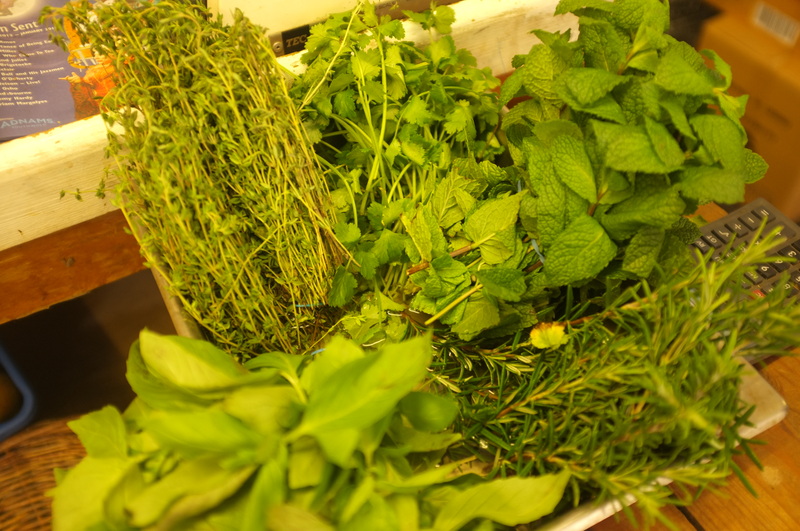 This means that, unlike both the greengrocers on the market, you can have as much or as little fresh parsley, thyme or coriander as you like. 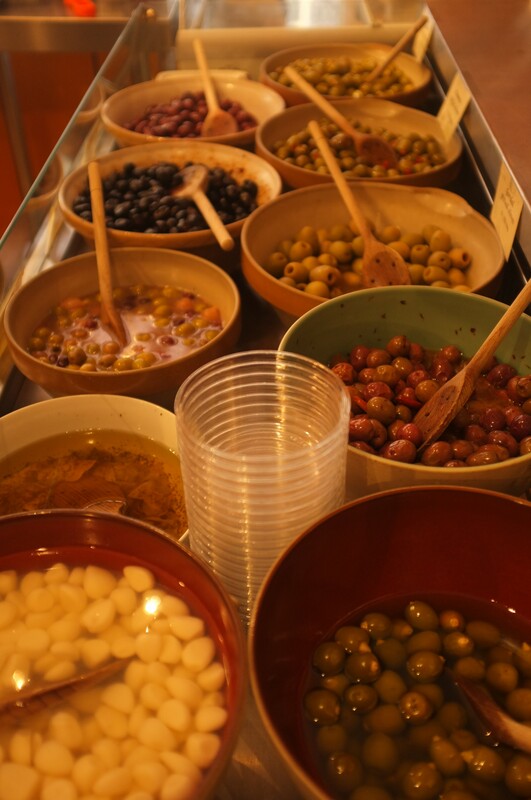 The shop has an extensive Asian Foods section and there are rumours that a new Mediterranean section might appear soon. 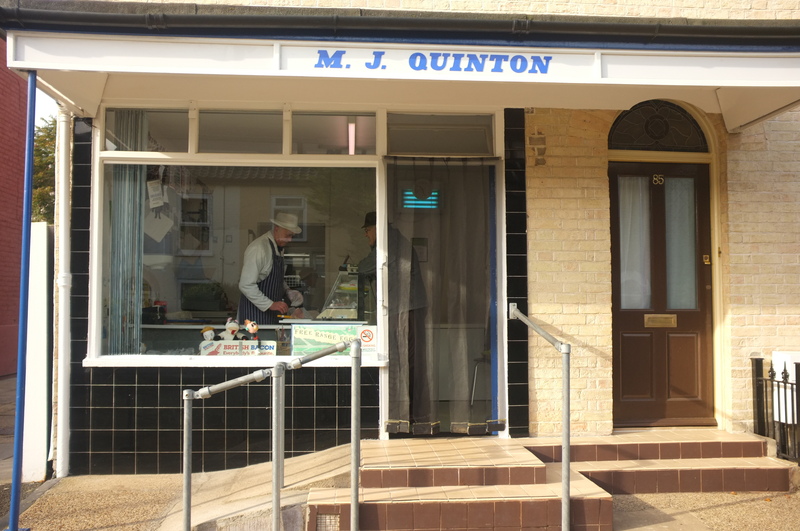 Quinton’s is my favourite butcher in Norwich, run by two of the finest gentlemen in the city. In My second and third years of University I was lucky enough to live three doors down. I frequented it for bacon, sausages, black pudding and duck eggs and Mike even let me borrow his allen keys and his wheelbarrow. As well as knowing all of the neighbours, Mike has never told me the same joke twice which is incredible seeing that he tells me two every time I go in there. 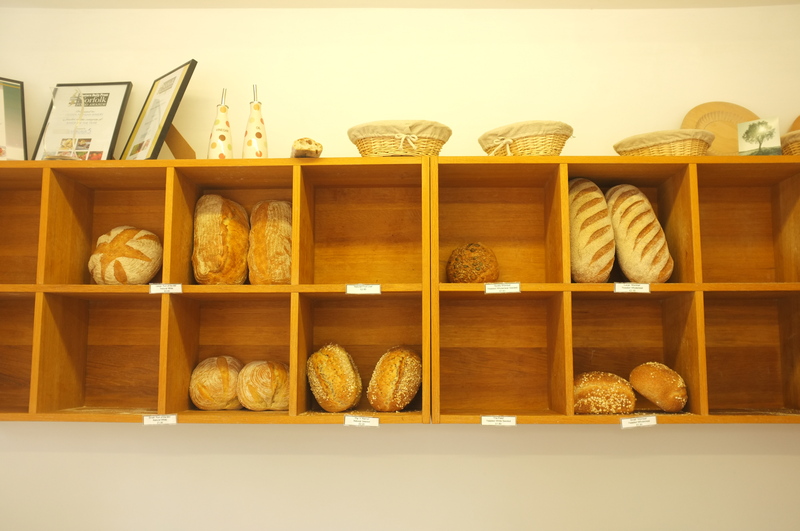 Dozen Artisan Baker is an award winning bakery that bakes simple, traditional bread using flour, water, yeast (or sourdough starter) and salt. 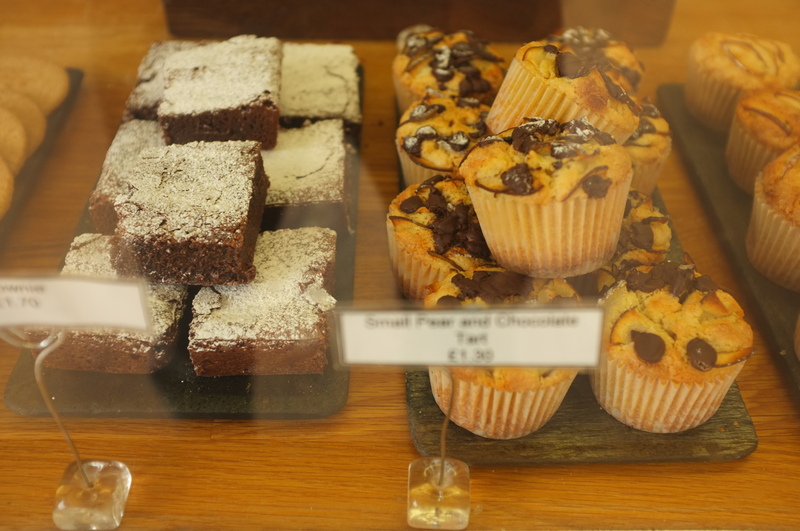 Their bread and cakes are made using organic flour over a long period of time in order to craft a product that is not only tasty, but also much easier for your body to digest. This is the kind of bread that we should be eating. Bread should not return to dough when squeezed. 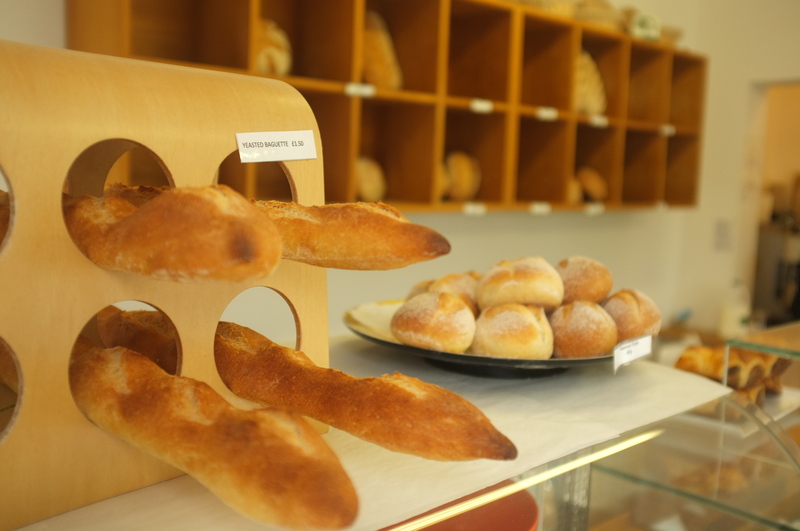 Bread should have character, crust and a wholesome flavour, none of which are achievable in factory made bread that is produced very quickly and pumped full of artificial additives and flour improvers. 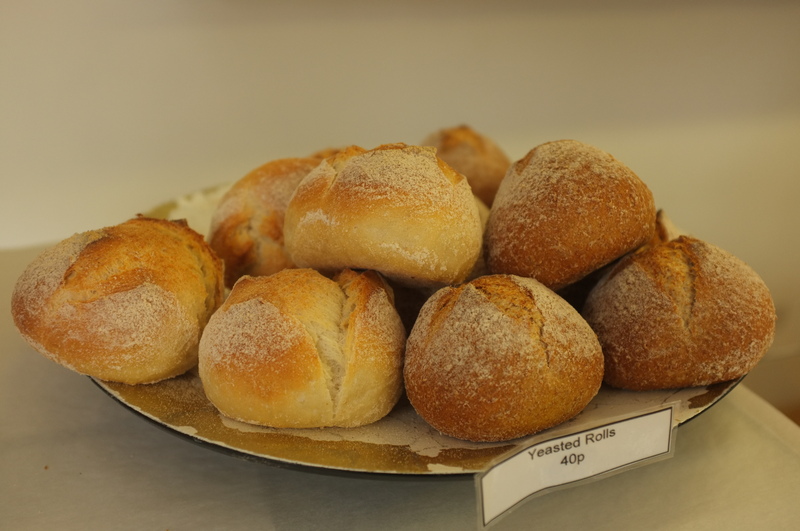 Real bread should start to go stale after three or four days and we should find this reassuring; bread that is as soft on day one as it is on day seven is against the laws of nature! If we pay an extra 40p for a loaf in an artisan bakery now and keep demanding real bread, then as the production of real bread increases, the prices will surely come down. 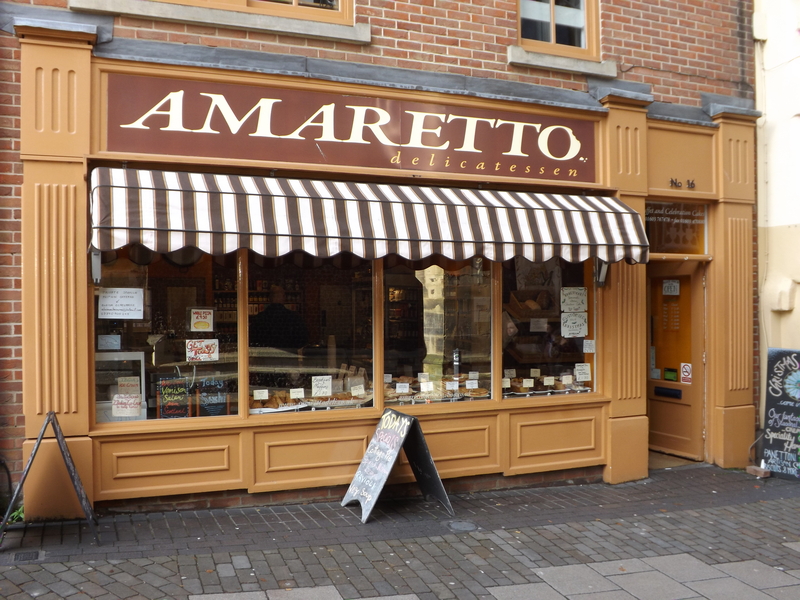 Amaretto is a deli selling specialist Italian, Spanish and British produce. The shop is popular with the students at Norwich University College of the Arts and when you walk by the big shop windows you can see why; on display are home-made sandwiches, stone baked pizzas, delicious cakes and pastries and a selection of hot lasagnes, cottage pies, stuffed peppers and other savoury delights. The inside of the shop is tastefully decorated, the service impeccable, and when you can get any double-shot coffee for just £1.60 you are on to a winner. Steve and Pam pride themselves on their locally sourced fresh produce and the quality of their service and today both of these were spot on. 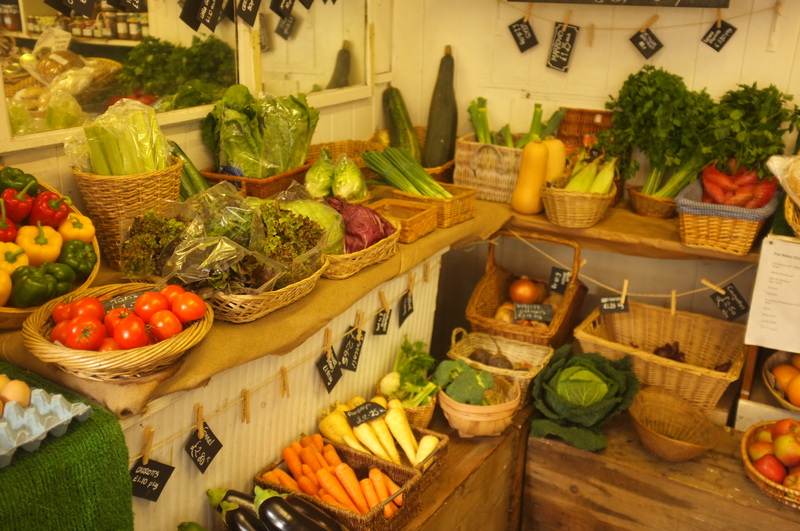 They gets as much of their produce as possible directly from the farmers, which means that their fruit and vegetables have spent as little time out of the ground as possible. If you want to order rare products like monkfish or purple cauliflower, Steve is your man. 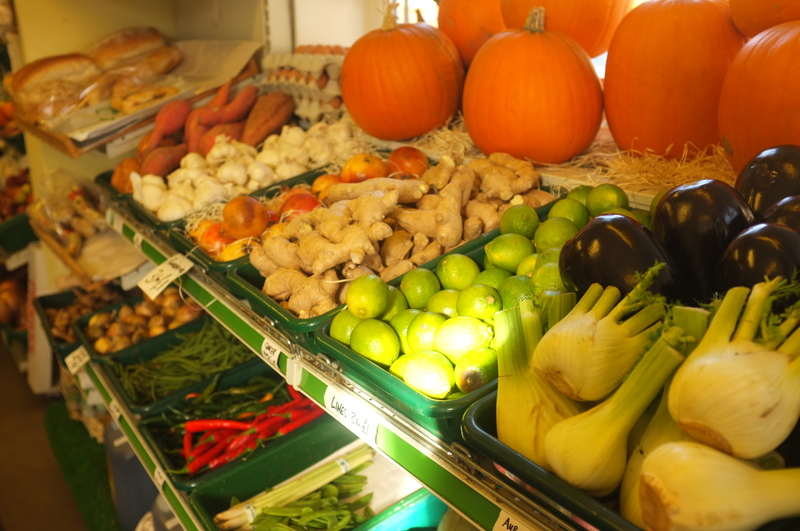 Shopping locally is not just a transaction involving money and food. 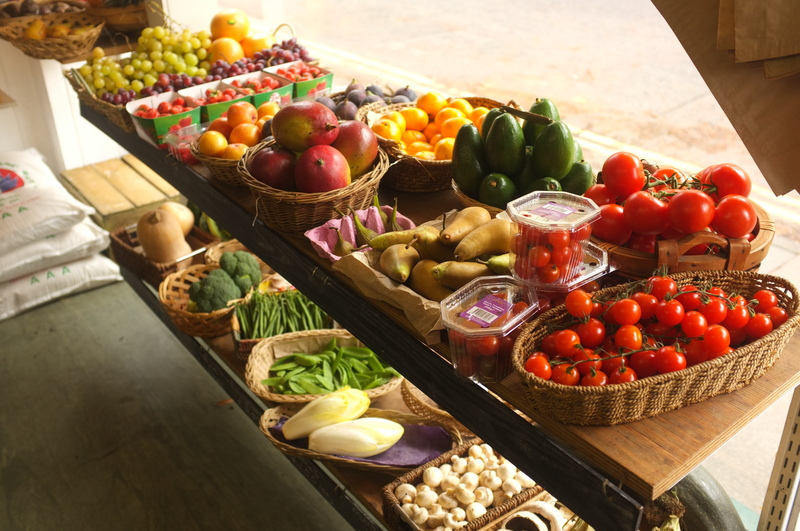 Shopping locally is an interaction with the community; it is an engagement in a product made or sourced by someone who more than likely appreciates your custom; and it is an investment in your health. I truly believe that engaging with where our food comes from is vital to good health and happiness. In the UK we are fortunate to have so many good small shops on our doorsteps and supporting these local businesses is a must.